Himalayan Whortleberry. 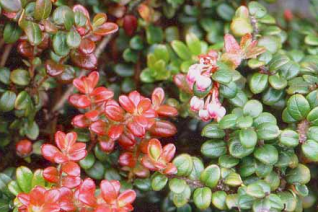 Cool, compact, slow growing very nice looking evergreen blueberry relative from the Himalayas. Small round leaves are dense on the stem and very symmetrical. New growth arrives bright red before settling to deep green. In spring striking red and white striped pendant flowers arrive in clusters. If pollinated they produce small blue/black tasty berries ( so far this has been rare for us). To 3′ x 3′ in 6 years for full shade to part shade in rich, well drained soil. Regular summer moisture. Excellent performance in a woodland or along a margin. Avoid dry compact soils which it intensely dislikes. An annual application of mulch will keep the roots cool and moist during the heat of summer. 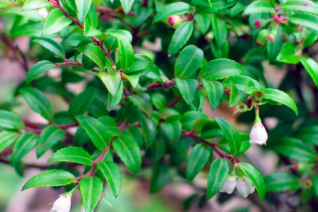 Evergreen huckleberry is a fantastic native broadleaf evergreen shrub. It is well adapted to shady sites and will accept full sun with regular irrigation. Well established shrubs require less water. Rich, humusy woodland soil is its favorite haunt and it will grow moderately fast to a rounded outline of 8′ tall and 6′ wide. The new growth is a beautiful salmon pink before changing to deep green. In spring and early summer small white urn shaped flowers are pretty and transform into tasty black fruits in autumn. Amazing in muffins, pies. Easy to grow good garden plant. Oregon native plant.